Drummer Peter Erskine appears on over 600 albums and film scores. He has won two Grammy Awards plus an honorary Doctorate from the Berklee School of Music. He's played with such greats as Weather Report, Diana Krall, Steely Dan, Rickie Lee Jones, Kate Bush, Linda Ronstadt, Joni Mitchell and Maynard Ferguson. Also, his work leading a world-renowned trio with pianist John Taylor and double bass player Palle Danielsson over a five year span resulted in four critically acclaimed recordings for the ECM label. And now…. today…. Tetra Speakers….makers of the musician’s speaker…. 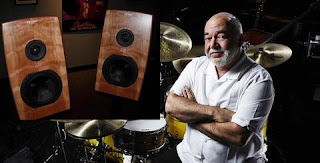 is very pleased to announce that Dr. Peter Erskine has joined Tetra’s “Who’s Listening to Tetras at home” ensemble with his very own set of Tetra Speakers….HOORAY!!! Obviously, we couldn’t be any more stoked over this very cool Tetravelopment so please check back for more fantastical Tetra stories about Peter and his Tetra high-end speakers.